The Phoenix theatre is your venue for one of the most popular shows to come out of Broadway for a long time, a Canadian musical that explores the impact of 9/11 and which has already gathered so much critical acclaim it can barely stagger out from underneath. It's brilliant. Don't pass up the chance to see this remarkable musical. 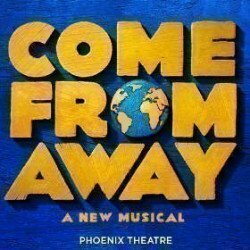 Welcome to Come From Away. With a magnificent entrance on the corner of Charing Cross Road and Flitcroft Street, the Phoenix Theatre presents an impressive rotunda with four huge columns above the canopy. Inside there’s a wonderfully ornate Italian-style scarlet and gold interior with a gorgeous reproduction of a painting by Italian master Jacopo del Sellaio, called The Triumph Of Love. Before the Phoenix arose from the ashes, there was a music hall on the current site, the Alcazar, which presented three acts at once each night. Over time it became a gambling den, then spiralled further downwards to become a peep show! In 1930 the original premises was demolished, to be replaced by the current building, built in 1930 and designed by Giles Gilbert Scott, Bertie Crewe and Cecil Masey. First opening with Theodore Komisarjevsky as the Art Director, the venue struggled at first, showing a mixture of plays and variety shows. But it was Noel Coward’s plays that brought it to life. Noel Coward's Private Lives, with Coward himself playing a part and starring giants Gertrude Lawrence, Adrienne Allen and Laurence Olivier, premiered there and set the stage for its future success. Noel Coward and the Phoenix Theatre went hand in hand for some time. The great man was fond of the venue and in 1936, three years after the theatre’s opening, his production of Tonight at Eight Thirty hit the big time. 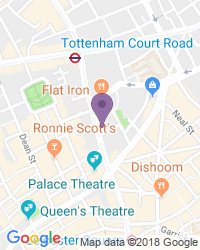 Over the years his plays made such an impact that the theatre named the foyer bar, which he opened himself in 1969, after him to recognise his contribution, to mark his 70th birthday. There’s also a beautiful little quiet space, the Phoenix Garden, built behind the theatre on an old car park, open to the public. Hauntings at the Phoenix Theatre! The Phoenix, like many of the West End’s theatres, is apparently haunted. Various ghostly presences have been seen and felt in the theatre’s toilets, the balcony and in backstage areas and it’s thought to be the reason why the balcony is locked up during most of the theatre’s performances! The Phoenix Theatre enjoyed a succession of hit productions over the years including John Gielgud's Love for Love, staged during World War Two, a full season of plays by Paul Scofield and Peter Brook in the ‘50s. The Canterbury Tales, Chaucer's famous book, was put on stage as a musical for the first time in 1968 and ran for more than 2000 performances. In the ‘80s and ’90s award winning shows like The Baker's Wife by Stephen Schwarz and a popular run of Shakespeare plays played The Phoenix. But musicals are the Phoenix’s theatre’s real stock in trade. There’s easy access for wheelchair users via the Flitcroft Street entrance. While there are no transfer seats available, there is a wheelchair space in Box C and two chairs in the Box. We’re your top destination for a wide variety of seat types and prices, with excellent availability on the full range of Phoenix Theatre tickets.